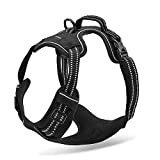 Function:This harness attaches in the normal back / neck area and also under the stomach area to give you extra control,fits most any dog comfortably and securly. High Quality:Stylish, durable, scratch-resistant oxford material outer layer. Comfortable lightweight mesh Lining with soft sponge padding in chest and belly. 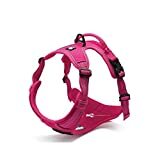 1:there are four adjustment straps which provide the best fit for your dog. sensation from the attachment on the back. adjustable. Sits well on the dog. The colour is good for late night walking.